This article by Robert Loerzel originally appeared in Pioneer Press on September 6, 2007. Grace Slick hasn’t sung on a stage since 1989. These days, the former vocalist for Jefferson Airplane and Jefferson Starship spends her time drawing and painting. Slick will make appearances Sept. 8 and 9 at the Wentworth Gallery in Schaumburg’s Woodfield Mall, where her paintings of rock stars, animals and Alice in Wonderland are for sale. Slick talked about her art and her musical career in a recent conversation from her home in Malibu, Calif.
Q: Is it true that you were born in Evanston? A: Or Highland Park. And I literally don’t know which. The hospital record says one thing, and the birth certificate says another thing, and both my parents are dead. I was only 2½ when I left, so I don’t remember Chicago. The first town I remember is L.A. I’m pretty much a California girl. 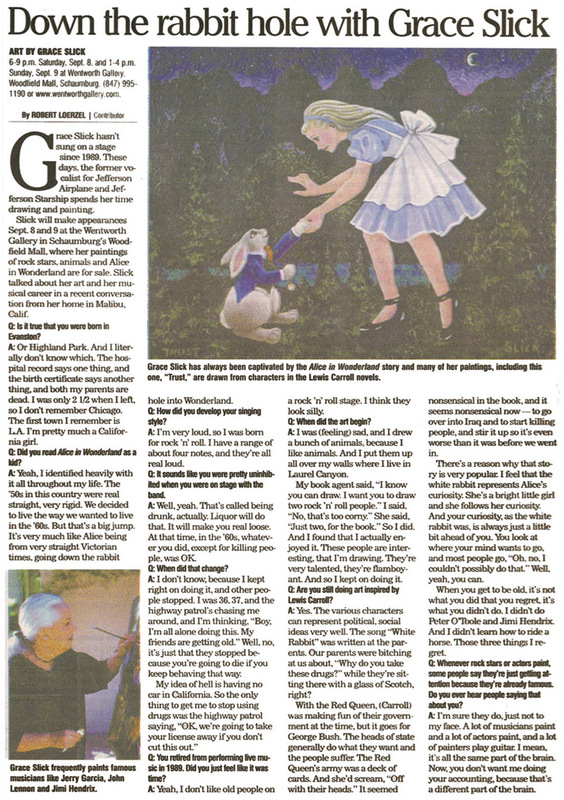 Q: Did you read Alice in Wonderland as a kid? A: Yeah, I identified heavily with it all throughout my life. The ’50s in this country were real straight, very rigid. We decided to live the way we wanted to live in the ’60s. But that’s a big jump. It’s very much like Alice being from very straight Victorian times, going down the rabbit hole into Wonderland. Q: How did you develop your singing style? A: I’m very loud, so I was born for rock ’n’ roll. I have a range of about four notes, and they’re all real loud. Q: It sounds like you were pretty uninhibited when you were on stage with the band. A: Well, yeah. That’s called being drunk, actually. Liquor will do that. It will make you real loose. At that time, in the ’60s, whatever you did, except for killing people, was OK.
Q: When did that change? A: I don’t know, because I kept right on doing it, and other people stopped. I was 36, 37, and the highway patrol’s chasing me around, and I’m thinking, “Boy, I’m all alone doing this. My friends are getting old.” Well, no, it’s just that they stopped because you’re going to die if you keep behaving that way. Q: You retired from performing live music in 1989. Did you just feel like it was time? A: Yeah, I don’t like old people on a rock ’n’ roll stage. I think they look silly. Q: When did the art begin? A: I was (feeling) sad, and I drew a bunch of animals, because I like animals. They make me happy. And I put them up all over my walls where I live in Laurel Canyon. My book agent said, “I know you can draw. I’ve seen these pictures of animals. I want you to draw two rock ’n’ roll people.” I said, “No, that’s too corny.” She said, “Just two, for the book.” So I did. And I found that I actually enjoyed it. These people are interesting, that I’m drawing. They’re multifaceted, they’re very talented, they’re flamboyant. And so I kept on doing it. Q: Are you still doing art inspired by Lewis Carroll? A: Yes. The various characters can represent political, social ideas very well. The song “White Rabbit” was written at the parents. … Our parents were bitching at us about, “Why do you take these drugs?” while they’re sitting there with a glass of Scotch, right? With the Red Queen, (Carroll) was making fun of their government at the time, but it goes for George Bush. The heads of state generally do what they want and the people suffer. The Red Queen’s army was a deck of cards. And she’d scream, “Off with their head.” It seemed nonsensical in the book, and it seems nonsensical now — to go over into Iraq and to start killing people, and stir it up so it’s even worse than it was before we went in. There’s a reason why that story is very popular. I feel that the white rabbit represents her curiosity. She’s a bright little girl and she follows her curiosity. She does it all by herself. And your curiosity, as the white rabbit was, is always just a little bit ahead of you. You look at where your mind wants to go, and most people go, “Oh, no, I couldn’t possibly do that.” Well, yeah, you can. When you get to be old, it’s not what you did that you regret, it’s what you didn’t do. I didn’t do Peter O’Toole and Jimi Hendrix. And I didn’t learn how to ride a horse. Those three things I regret. Q: Whenever rock stars or actors paint, some people say they’re just getting attention because they’re already famous. Do you ever hear people saying that about you? A: I’m sure they do, just not to my face. A lot of musicians paint and a lot of actors paint, and a lot of painters play guitar. I mean, it’s all the same part of the brain. Now, you don’t want me doing your accounting, because that’s a different part of the brain.